There is a nip in the air, and a familiar scent I can inhale deeply but can’t identify. Cosy in many layers of clothes, my notebook clutched in one hand, my hair ruffled by the light breeze, I tip-toe into the garden, on the bed of fallen autumn leaves. Some yellow and moist. Some orange and crisp. The stream nearby gurgles softly. Under the maple tree I sit, pen in hand, thoughts strewn in my head, an umbrella of leaves sheltering me. The setting sun casts a shadow on my words, as though urging me to look up. I look skyward, between bunches of leaves, orange and red, aglow with the golden sunlight. The ageing walls of the 13th century stone house that is Meldrum House glow warmly. Hints of the blue sky meet my eye. There is a nip in the air, and a familiar scent I can’t identify. On this blogging trip through the region of Abderdeenshire, we’re always going somewhere. We’re driving along tiny coastal villages, kayaking in a loch in the middle of nowhere, trying gin – brewed down the road – by the fireplace in an 800-year-old cave bar, hiking up to Oxen Craig (Bennachie) in the light rain, chasing sunsets, swaying on Tarzan swings, fueling up at an organic farm-to-table bistro. Then one evening in Stonehaven, time starts flowing a little slowly, like the cool salty breeze blowing into the vast North Sea, ruffling the tides. On the rocky shore I pause, thinking back to the beginning of our hike. 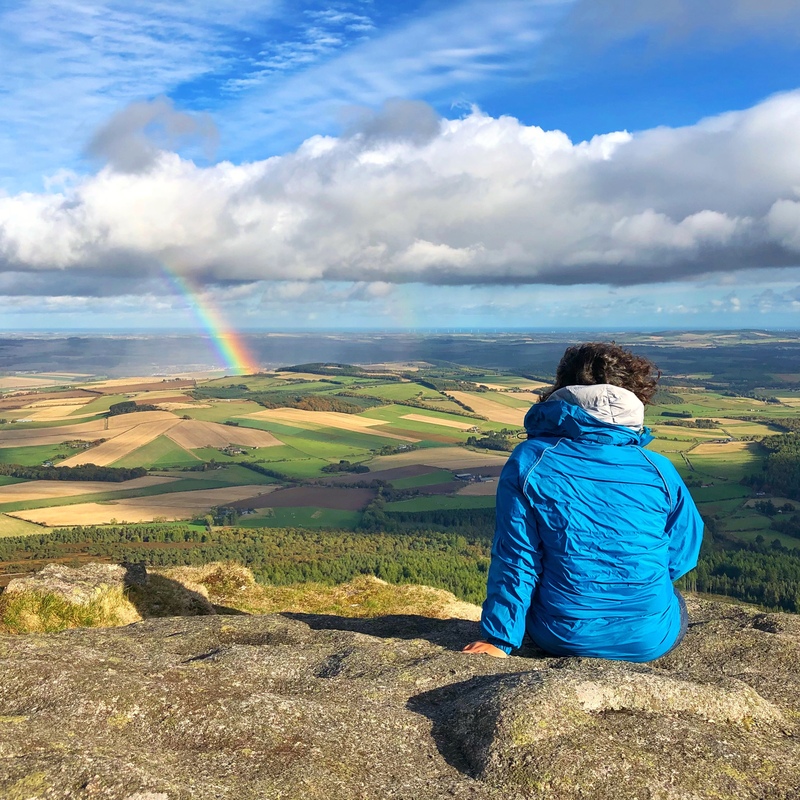 Up to the hills of Bennachie, when the rain finally ceased and a rainbow lit up the sky, an incredible sight. On the rocky shore I pause, thinking of the connection between slow food and life. At Buchanan Bistro on the Scottish countryside, food is not just fuel, it is grown with love, sourced with consciousness, served with pride. That slow food – delicious, farm-to-table, vegan-friendly – is life. On the rocky shore I pause, thinking of the ancient woodlands and rolling fields where we stayed the night. Banchory Lodge is a mansion hideaway by the riverside. My mind feels weary of saying no to plastic bottled water served mindlessly everywhere that finding recycled glass bottles in my room is sheer delight. And outdoors, writing under an old tree, by the River Dee, I can’t help but feel, this is the good life. On the rocky shore I stand up surprised, for the sky has unexpectedly erupted in the most gorgeous light. Turns out, you can kayak and hike, quad bike, eat well and keep your footprint light, yet Scotland will let you pause, stravaig and write. What are your impressions of Aberdeenshire or Scotland? *Note: I wrote this post in collaboration with VisitBritain, as part of the STS Belfast campaign with iAmbassador. Opinions on this blog, as you can tell, are always my own. Connect with me on Instagram, Twitter and Facebook to follow my adventures. Beautifully written. Exactly how I felt in Scotland. Spent 10 days “slow travelling” across parts of the country. And like you said, you can do a lot and Scotland can still help you pause. Also, how my husband and I wished we could settle down in Aberdeen! I only spent a day wandering about the streets of Aberdeen, and could totally see why you might want to live there! Loved reading your poetic article. I haven’t been to Scotland but I had similar experiences in Switzerland. Glad , I learnt a new word – Stravaig. Love that word too! And I can see some poetic similarities between Scotland and Switzerland! Yeah Scotland is such a beautiful and here today in this post i found so many beautiful clicks . Here all the thing is how you expressed your feeling, such a amazing. when i was reading it was like reading a book about Scotland and there all the things related to the famous places. Glad you enjoyed reading this piece, Jane! I’ve been away in Africa for ten months now and am just beginning to really miss the cold weather and comfort food from the British Isles right now. Aww, I can imagine. I’m sure your time in Africa has been quite an adventure though! Loved reading your blog!!! While reading your blog I felt as if I am experiencing it..
Scotland is known for its beauty within. What an amazing place it is and now that you have increased the amazement of this place with your this article to a level high. Loved this post! The sentences oozed such warmth. R u visited Isel of sky? Previous PostWhat No One Tells You About Writing and Publishing a Book in India. Next PostIncredible Ways to Experience Sri Lanka.